Your subscription will help us get out the vote (GOTV) for the 2020 Presidential Election. 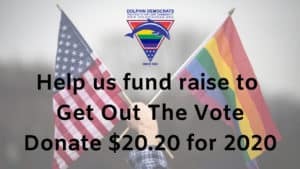 In 2018, thanks to all the generous donations we were able to sped over $5,000 in Get Out The Vote efforts. The funds allowed us to print 15,000 palm cards and publish ads in South Florida Gay News, Hotspots, Facebook & Instragram. Thank you for supporting our GOTV efforts.